Three attorneys were from Ropes & Gray’s Boston and New York offices while the two others were from New York white collar defense boutique Smith Villazor, including co-founder Patrick J. Smith. But Caplan and dozens of others who suddenly found themselves in a serious legal jam consulted the same playbook when it came to expertise. Their legal pros include attorneys with a special skill set to take on bribery, conspiracy, and money laundering—former federal prosecutors. Prosecutors in the bribery matter hail from cities like Los Angeles, New York, and Boston. 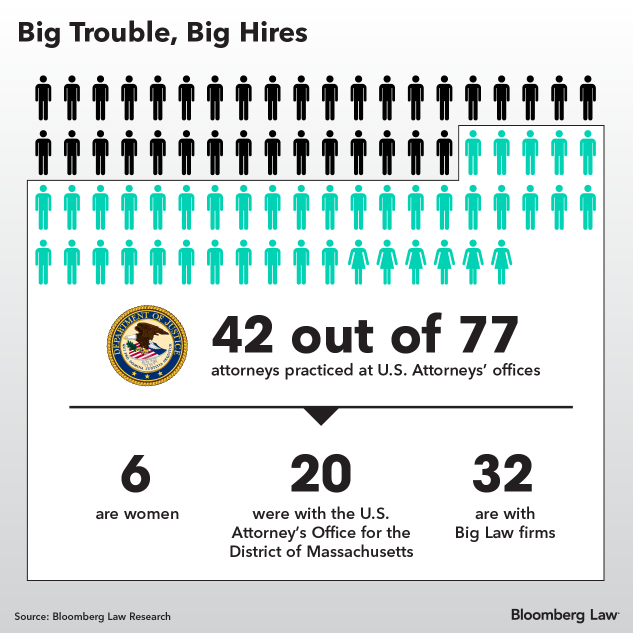 Of the 77 attorneys listed on the Boston federal court docket as representing the 30 parents, 42 worked as federal prosecutors, according to a Bloomberg Law analysis. Some helped prosecute the Boston Marathon bomber and notorious Bay State gangster James “Whitey” Bulger, who was killed behind bars. “You’re paying for judgment that has been honed through experience,” said Justin Dillon, a partner at KaiserDillon in Washington and a former federal prosecutor in the District of Columbia. The college bribery case, where numerous well-off parents paid millions to have others manipulate the admissions process for their kids at elite schools like Yale, Stanford, and the University of Southern California, triggered nationwide public outrage. Many of the parents now face charges in Boston federal court, and the Justice Department is being especially aggressive. Fourteen parents, including actor Felicity Huffman, have agreed to plead guilty. The 16 parents who didn’t agree to a deal now face additional fraud and money-laundering charges. Former prosecutors have plenty to offer the college bribery defendants. They have sharp litigation skills, insight into how the government brings and manages cases, and helpful connections. There are 93 U.S. attorneys who act as chief federal law enforcement officers in 94 federal districts. They supervise assistant U.S. attorneys, who represent the federal government in litigation. Prosecutors often leave those offices for major law firms where they defend clients in white-collar matters and investigations. The college bribery defense teams include 32 Big Law attorneys who worked as federal prosecutors, including Joshua S. Levy from Ropes & Gray in Boston and Melinda Haag, who’s with Orrick’s San Francisco office. Alums of a U.S. attorney’s office have a certain level of litigation talent—the kind that can appeal to high-end clients in trouble. It’s a very desirable position, and even getting hired as a federal prosecutor with a U.S. attorney’s office is an “extremely competitive” process, said David Lat, attorney and founder of the legal blog Above the Law. He worked as a federal prosecutor during former Gov. Chris Christie’s tenure as U.S. attorney for New Jersey. “It’s not uncommon to have hundreds of applicants for a single opening, especially in a major metropolitan center,” Lat said. He added that it’s often harder to get hired as a federal prosecutor than it is to get hired by a top law firm. And then, once a lawyer has joined a firm, they can draw on their vast experience and perspective gained trying cases at a prosecutor’s office. They “tend to have lots of trial experience, which can’t be said for many litigators who rose up the ranks in firms,” Lat said. "[It] helps to know how the government thinks because this can help you frame your arguments to the government in a way that it might find more appealing, especially if you represent someone who is on the border of whether they’re going to be charged or not,” he said. He also noted that others involved in government cases, like public defenders, may also have good perspective. Then there are the all-important, extensive networks with their old offices and colleagues that former prosecutors offer. The ex-prosecutors hired in the college bribery case demonstrate that even when a lawyer moves to white-collar defense, it’s still a small world. Former prosecutors “often have valuable relationships with their former offices, giving them credibility when they represent defendants in cases handled by those offices,” Lat said. The 42 former federal prosecutors in the case have mostly worked in three districts—the Central District of California, the Southern District of New York, and Massachusetts. Almost half come from Massachusetts, where the college bribery case was filed, and a few have even worked together in the past. Quinn Emanuel attorney William Weinreb, who’s representing defendant Robert Flaxman, was the lead prosecutor in the investigation and trial of Boston Marathon bomber Dzhokhar Tsarnaev. His successor at the U.S. attorney’s office in Boston, Andrew Lelling, is leading the case against the bribery defendants. 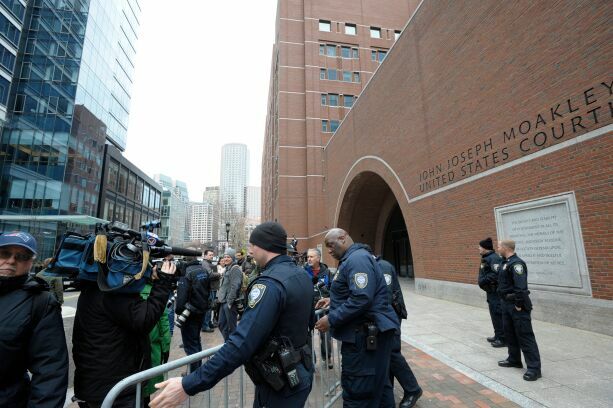 Jack W. Pirozzolo, a partner at Sidley Austin’s Boston office representing defendant William McGlashan, Jr., also worked on the Boston bomber prosecution. Pirozzolo also oversaw the apprehension and prosecution of Bulger. Nixon Peabody attorney Brian T. Kelly, a former federal prosecutor in Massachusetts who’s representing Gamal Abdelaziz in the bribery matter, was involved in Bulger’s prosecution as well. Kirby D. Behre, a partner with Miller & Chevalier in Washington and former federal prosecutor in Washington said working at a U.S. attorney’s office is a common bond that can be an ice-breaker at the start of a case. But as the case proceeds, he said, the relationship doesn’t necessarily guarantee more. “What it will get you is a conversation, not a result, and that’s an important distinction,” said Dillon. Another thing to be cautious about is what kind of former prosecutor you hire, Dillon said. There are two kinds: Those who believe the government is always right and those who think the government’s often unfair, he said. You want the latter on your side, Dillon said. Because no matter who you hire—a former federal prosecutor, former federal public defender, or an attorney who’s learned through lots of experience—"what you want in a defense attorney is someone who will be in the trenches with you,” he said.